The evolution of our new Git UI that we began in Orion 6.0 is now complete. All major Git capabilities are consolidated on one page, with a two-pane layout similar to the Orion editor. The left hand side shows a history timeline, and has operations for manipulating branches such as fetch, merge, squash, push, etc. A new Sync button has been added which performs all the most typical operations to get your local clone synchronized with the chosen reference point (merge or rebase, then push). Fetching occurs automatically every time you visit the Git page. The right hand side is used to display commit details, create new commits, and perform operations on commits such as reset, tag, cherry-pick, etc. Overall, this new layout makes much better use of available space, is more touch friendly, and simplifies the most common Git workflow. The underlying implementation has also had some significant performance work, making many operations much snappier than the previous release. The separate global search page has been replaced with a fly-out that appears directly in the editor. This reduces context switching and allows you to more seamlessly integrate searching into your editing workflow. All the same search and replace capabilities are available in this new UI. Read more about it here. 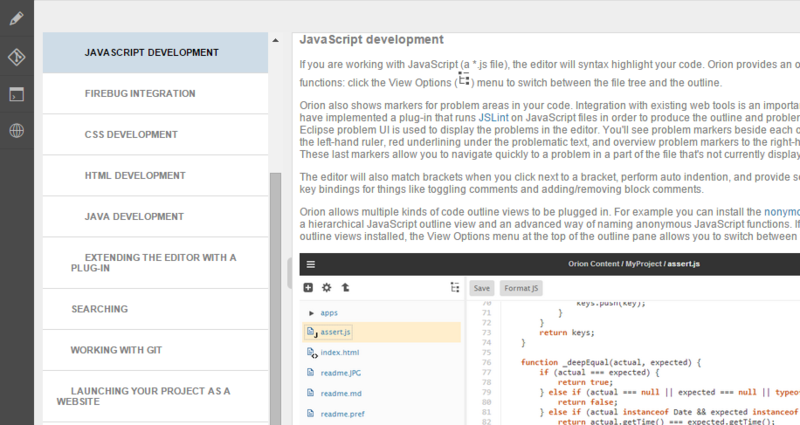 The Orion editor has initial support for hover help aid in code exploration. If you hover over a function, the rendered documentation for that function is shown. 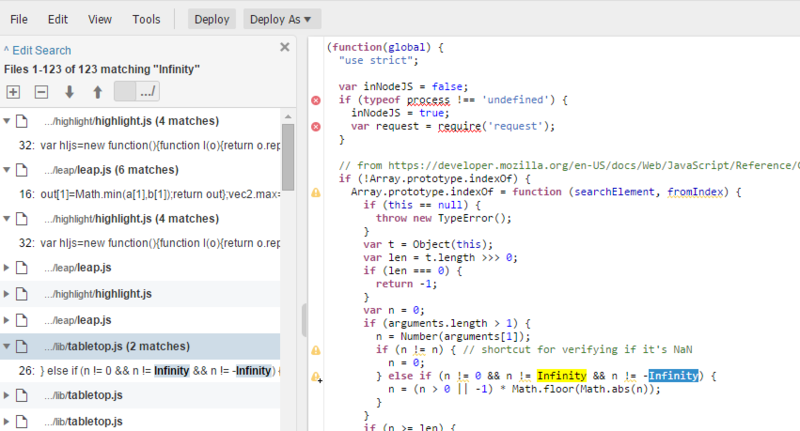 In Orion 8.0 we will hook this more deeply into the static analysis engine to provide hover help in many more places. Support has been added for authenticating with Google+ and GitHub auth. Read more about it here. This release has many new features for developing and deploying for Cloud Foundry. Orion now has a Cloud Foundry manifest editor with syntax highlighting, error and warning reporting, and content assist. The deploy dialog now has support to launch applications with missing or incomplete manifests, with the option to persist missing manifest content during deployment. The Orion Java server has been architected to support multiple concurrent server instances behind a reverse proxy. This architectural change enables scenarios such as fail over, load balancing, and zero downtime upgrades of the server. This work involved more comprehensive use of file locking to avoid contention between server instances, and making sure only one server performs background tasks such as search indexing to avoid work duplication. The server also now always separation of instance-private disk state from content that needs sharing between instances. Stay tuned for more documentation on how to configure and deploy multi-instance Orion clusters. It has been a busy four months! Our next release, Orion 8.0, will be coming at the end of February, 2015. Until then, enjoy the cloud coding! This entry was posted in Announcements, New & Noteworthy. Bookmark the permalink.